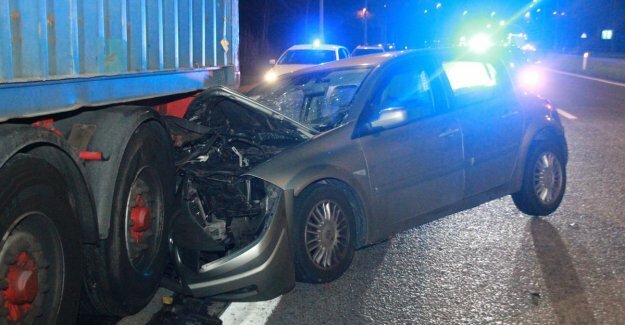 Deerlijk On the N36 in Deerlijk is a Renault Saturday night around 19.50 hours against a parked semi-trailer, popped. The driver from Harelbeke touched as if by miracle unharmed. “I must have fallen asleep,” says the man. “I was very tired, and was on the way back from a trade show,” says the director. “A colleague had me deposited on the carpoolparking in Deerlijk where my car was. On the way to there, I had already slept in his car.” The driver drove from there in the direction of the Director home, but it went almost immediately wrong. “I must have fallen asleep. Suddenly I shot awake, I didn't know what had happened. I got out of it and when I saw the damage, saw, called I the the emergency services. I'm incredibly lucky.” By the accident was the N36 at the height of the carpoolparking in the direction of Harelbeke for a while closed to traffic until the badly damaged car is hoisted.